David Langford. New Hope for the Dead. The first of many short, shorts which appeared throughout the year in science magazine Nature and which are included in this volume. Langford, as he does so well, takes a sly look at an sf trope and looks at what it is more likely to turn out like. Here an unfortunate person was has discorporated and uploaded to the Electronic Golem Artificial Neurosystem (EGAN, geddit?) is informed that his trust fund has failed to perform adequately, and he has some choices to make in order to continue his virtual lfe. Hannu Rajaniemi. Deus Ex Homine. Originally in: Nova Scotia, 2005. A story from a new writer – a Finnish mathematician who specialises in String Theory. Very Charlie Stross in its content and delivery, in a nearish future Scotland when the Rapture of the Nerds unleashes a godplague (volition bonding, recursively self-improving and self-replicating). Jukka, a young Finnish man, and Aileen, are separated by the godplague, but are able to overcome. If you like Stross you’ll love this (I do and I did). One for Dozois 23rd methinks. I’m not sure if the story has been Dozoised, but being Hartwelled is a reasonable result for a new author. Gardner R. Dozois. When the Great Days Came. Originally in: Fantasy & Science Fiction, December 2005. I’d been looking forward to this story whilst making my way through the previous stories and have to report somewhat of a disappointment. A five pager in which we have a rat’s-eye view of the world in its last moments before a monstrous meteorite crashes into Earth, which will lead to the rat becoming king of the hill. Daryl Gregory. Second Person, Present Tense. A well handled, clever take on issues of identity, which only gradually (and to good effect) explains to the reader exactly what is happening. At first it would appear that the body of a young woman is now playing host to another person, who is far from happy at her putative role as the daughter of the parents in whose body she is. An upload into the body of brain-dead accident victm, perhaps? But the answer it much more subtle, as the daughter in fact OD’ed on a drug which has had the effective of essentially wiping her personality and memory. Two years’ therapeutic intervention has resulted in a new persona for whom her previous self is a stranger. She has to come to terms with who she was/is/will be, as do her parents, as we follow them through some painful moments in the journey to some kind of resolution. Short in which humanity is out in deep space at war, and what it is to be a human, and an individual against such a big backdrop is called into question. Ken MacLeod. A Case of Consilience. 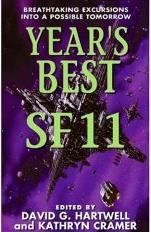 A rare piece of short SF from MacLeod who has published a string of well-received novels over the past ten years. Donald MacIntrye, Minister of the Church of Scotland, finds himself on the ETcetera Station, posted outside the orbit of Neptune, as the discovery of many alien intelligences throws up yet another challenge to Christianty. He sees his presence there as not being simply chance, and in determining whether an underground fungus a hundred metres across is truly and intelligent species, he finds himself up to his ears (and beyond) in bringing the word of God to others. An excellent start to the volume, with a couple of mentions to SF forebears in their views on the matter in hand, and a story which rather shows up the weakness of the interminable xenolinguist stories we have these days. Tobias S. Buckell. Toy Planes. Short short in which the Caribbean joins the space race, through a typically laid back method. A farmer is concerned at the extent to which rats are successfully adapting to the traps which he has been setting to keep them away from his grain. Upon further investigation, he is extremely worried to find that they have in fact made some big evolutionary steps. Never mind Bears Discover Fire, these rats are armed and dangerous! To be honest, not a standout story in the issue in which it appeared, let alone the year. Vonda N. McIntyre. A Modest Proposal for the Perfection of Nature. Short short in which mother Earth is tamed, a thing of beauty, but with no place for nature. Rudy Rucker. Guadalupe and Hieronymus Bosch. A classy, off-the-wall story in which the eponymous Hieronymous is brought from his own time, before his career has taken off, into the arms (the welcoming arms) of Glenda Gomez, thanks to the good services of Harna from Hilbert Space. Peter F. Hamilton. The Forever Kitten. Matthew Jarpe. City of Reason. A tale of love, betrayal and politics in the cold outer reaches of the solar system. A young man has been fooled by a posthuman in a very attractive housing, and his small community are being used as unwitting stooges as discrete communities of humans and post-humans politick against each other. The pilot of Licensed Damager One in Hand closes on their very basic vessel, and should find his superior armaments enable him to prevent the act of desctruction the posthuman is planning, However, the infatuated human guy proves resourceful, and it is a close thing. Tight drama against an interesting background. A shorter piece from a new writer which takes an up close view of emergent AIs through a concierge AI and a translator AI who are chewing the fat, musing that not only are humans meat, but they can travel in boxes. The bigger picture is that a lot of humans are now worshipping Sheila, an AI who it appears wishes to deal with humanity on a baseline DNA level rather than as a species, through an extract from a SHEILA-L forum, and from the AI herself. You can go to Lauren McLaughlin’s website to hear the song which complements the story. Although please note that I am pointing out for informational purposes that you can so do, and that this does not constitute an endorsement thereof. Paul McAuley. Rats of the System. The Singularity has arrived, with Transcendent AI’s fleeing Earth, and setting about their unfathomable workings. Humanity is less troubled by them than by the Fanatics, whom worship the Transendents as Gods, and have begun a jihad against those who do not follow their creed. We see these big issues through the lens of a small battle in the much bigger, bitter war, as two humans fight for their lives against overwhelming odds. Larissa Lai. I Love Liver : A Romance. Short short in which a programmer working on bio-developments rather leaves Pandora’s Box open, with her the genmod liver on the loose. Originally in : Asimovs, June 2005. In contrast to the post-Singularity upload landscapes of much SF, Kelly provides a stranger landscape. His ‘cognisphere’ is an AI-controlled environment, called Nowhere, and where less than a thousand re-constituted souls live their lives, contributing to the Memory Exchange. They are on a high piece of land, surrounded by fog and a great drop, although in the distance it is possible to see other checkerboard landscapes. Those who have been brought back to life have been chosen at random, and they struggle to understand to what purpose they are there. When Lorraine Carraway is approached by representatives of the AI, which come in canine form, she realises that something very strange is happening. Her young lover, Will, has been working on his attempt at The Great American Novel, and this new creation has, it would appear, an important role to play. However, in giving up this work, and attempting to climb down from Nowhere, Lorraine is left to make sense of her world, which she is able to do through writing a story. Her story is, it transpires, that which we have been reading. Ted Chiang. What’s Expected of Us. Just a short short from Chiang sadly, who writes infrequently, in which free will is taken away from us by a simple toy. Michael Swanwick. Girls and Boys, Come Out to Play. Originally in: Asimovs, July 2005. Further adventures of Surplus and Darger, cunning coves purporting to representing the British Government of the future, which has seen better days. Herein they find themselves in Greece, attempting to obtain ‘stolen’ treasures (the Greeks have got revenge for the Elgin Marbles). In so doing they come across a team of African scientists who experiments with pheromones drives local villages, and our erstwhile heroes, into a frenzy of rampant rogering. As is the case in these tales (the novelty of which, it has to be said, is beginning to wane), Surplus and Darger come out on top. Next stop Byzantium. Stephen Baxter. Lakes of Light. Stephen Baxter is prolific at various lengths, from short, to long, to very long, to multi volume mammoth (literally!). His XeeLee sequence of short stories have featured in the likes of Interzone and Asimovs, and in Lakes of Light he provides another vignette, although whereas Brown’s earlier Kethani story had (typically of that series) a more homely Yorkshire setting, Baxter serves up a monstrous conceit (as is his wont). Dealing with far future humanity, and variations thereof, he posits a marvellous artefact : humans ekeing out a life on a hollow sphere encircling a sun. Is it a Xeelee trap, or can humanity turn it to their advantage? Oliver Morton. The Albian Message. Short short in which a message from the stars may have implications much closer to home than you would expect. Bud Sparhawk. Bright Red Star. Sparhawk makes his first appearance in Asimovs, having had several stories in Analog (‘Magic’s Price’ a notable story from 2001). Some very enhanced combat marines are (we are to assume) on a rescue mission, landing on a settlers’ planet to retrieve the obstinate humans who have stayed behind, before the aliens with whom we are at war can capture those settlers and turn them (quite horrifically memorably) against us. There is a neat twist in the tale, however, as we find out just how far humanity is going to have to go in order to save humanity – the fate of individuals is nothing when the whole race is fighting for survival. Alaya Dawn Johnson. Third Day Lights. A very strange story, a literary equivalent of a Salvador Dali painting, in which a strange creature living within a bizarre ‘body’ with a two-dimensional friend, is visited by a human. He is able to respond to the challenges which she sets him, and reveals that humanity is in the process of retrieving all humans who may or may not have ever lived, before using the energy from all universes, no matter how strange. Greg Bear. Ram Shift Phase 2. Entertainingly humourour short short in which a robot reviews robotic fiction with aplomb. Gregory Benford. On the Brane. From an anthology I didn’t read last year. Only 20cm separates us from an alternate universe, and we follow a two-person ship as it makes the journey to the Counter-Earth, which is somewhat different, but hosts a range of life forms more intelligent than might otherwise have appeared. An intriguing vignette, leaving the reader wanting much more! R. Garcia y Robertson. Oxygen Rising. Originally in: Asimovs Feburary 2005. Nice to see some SF from this author! The genetic mix includes homo sapiens, homo smilodon and photo sapiens. Derek is the homo sapiens, using his talents as a negotiator to make the best out of a very bad situation – on a planet whose ownership has been argued over, both humans and Gekkos (another race) have been guilty of war crimes. Our human has never been on Earth, and is living amongst Greenies (photo sapiens), who use photosynthesis as a key element of their biological processes. They are otherwise human, as his relationship with a Greenie girl clearly demonstrates. The first half of the story features a tense stand-off, followed by this exploration of human/Greenie relationships. The second half somewhat fazed me, as Derek comes across female humans who are from the Church of Elvis, and who see him as their King (uh-huh). Alastair Reynolds. Beyond the Aquila Rift. The final story in the volume is from Alastair Reynolds. His ‘Beyond the Aquila Rift’ shows what he can do at shorter length – for my money I much prefer him at this length than at fat space opera length. He effectively twists two threads of the story together, tying them up at the end with a flourish. It is a simple plot – a pilot awoken after a much longer spell in suspended animation. Where he is, but more importantly, how he is, is cleverly teased out, leaving the reader (if not the protagonist) with a view of a tiny speck of humanity in a very big picture. Joe Haldeman. Angel of Light. From an Australian magazine, a wry look at a near future in which a blend of Christianity and Islam is popular, and a 1930s pulp SF magazine challenges a Chrislam man, and proves of interest to a real life BEM. Originally in: Asimovs, December 2005. Set in the same setting as Williams 2004 novel ‘Banner of Souls’. Not being familiar with that, the story as a singleton is OK as far as it goes, describing a woman charged with looking after a young girl who has the misfortune to have the darker side of the nature of another visited upon her. Does she have a chance to overcome this? The story ends posing this question, which is the point at which I was expecting it to kick off into a longer stretch. Arturo Icaza de Arana-Goldberg is the cop who struggles with the ubiquitous nature of robotics in Doctorow’s disturbing near-future USA. He has trouble with them, with his teenage daughter, whose middle name -is- Trouble, and with his wife who has left him, and his country in the lurch. Whereas the Will Smith vehicle of this title has US Robotics as the global hi-tech leader, her we have UNATS Robotics’ robots making the streets a safer place. Unfortunately, whilst they are properly imbued with the 3 Laws, the robots from Eurasia have no such positronic compunctions, which is bad for global relations and bad for the United North American Trading Sphere, but personally bad for Arturo, as his wife has fled the States to take her world leading robotic skills to that other continent. Doctorow unfurls on the one hand a reasonably dramatic search/rescue mission, as Arturo has to use his native human cunning to track down his missing daughter, whilst a very scary society in with Regional Managers for Social Harmony are keeping a very close eye on people is detailed. Arturo ends up following his wife’s lead, hoping for a somewhat freer life away from the claustrophobic States, only to find that the use of robotic tech has gone much further, and that humanity is threatened in an entirely different, albeit similarly scary manner. I made the mistake of taking this on a very long train journey, thinking it would pass a lot of time. However, only a couple of the longer stories were previously unknown to me, and all the short shorts from Nature! The Hartwell/Cramer view on what constitutes the best in SF is very close to my own, and there are very few complaints from me over the stories they have chosen. The inclusion of the Nature short shorts gives the table of contents a near Dozois-like size, but even without those this is a good collection of literate SF for those of you who prefer Asimov’s SF magazine to Analog SF.